For around $1000 a head, cruisers and Melbourne Cup first or second-timers will be spending six nights on a ship, will attend the Melbourne Cup and indulge in all cruise ships have to offer. Australia’s largest cruise operator Carnival Australia will send a quaddie of ships to the Melbourne Cup from Friday, with four superliners delivering 8000 guests to the race that stops a nation. For the second year in a row, the four ships — P & O Cruises’ Pacific Dawn, Pacific Jewel and Pacific Pearl and Carnival Cruise Line’s Carnival Spirit — will deliver 8000 punters to the Cup. This represents the single biggest group to attend the event (about eight per cent of overall attendees) as well as the largest contingent of interstate visitors (about 16 per cent). More than 160 coaches will transport the guests between their ships and the racetrack, with general admission to the event included in the cruise fares. 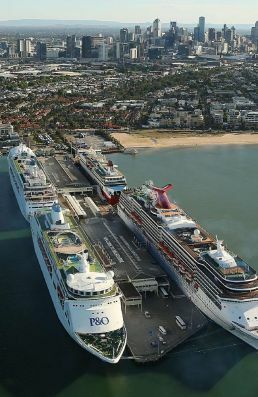 Three of the ships will be turning heads as they take up their positions at Station Pier in Victoria, while the fourth ship — P & O Cruises’ Pacific Dawn — will create a spectacular sight sailing under the Melbourne’s West Gate Bridge to berth upstream at Victoria Dock, close to the heart of Docklands. With a soaring air draft of 47.6m, the 70,285-tonne Pacific Dawn made history last year when she became the first superliner to sail under the Bridge. The spectacle will be repeated again on Melbourne Cup morning, next Tuesday, when she is expected to pass under the bridge around 7.15am. Ann Sherry, Executive Chairman of Carnival Australia, which represents P & O Cruises and Carnival Cruise Line, said the Emirates Melbourne Cup remained a firm favourite among cruise guests. “We’ve been sending ships to the Cup for close to 50 years, and the fact that it’s now become a four-ship event just shows that our Emirates Melbourne Cup cruises have become a winner, not only for our guests but also for the Victorian economy,” Ms Sherry said. Ms Sherry said the four ship visit was expected to inject close to $7 million into the economy in guest and crew spending as well as port charges and fees, with the ships spending a combined 11 days in Melbourne. All four ships will carry a field of Melbourne Cup personalities, race callers and jockeys, as well as fashion and style experts, well known Australian entertainers and even a Melbourne Cup or two, enabling racegoers to get in the mood from the moment the ships sail from Sydney and Brisbane this weekend. In its 48th year of cruising to the Melbourne Cup, Australia’s only homegrown cruise line P & O Cruises is offering a line up of on-board talent and entertainment including fashion parades featuring Australian designers and its first betting master classes. Three P & O ships will sail with Pacific Jewel and Pacific Pearl departing on six-night itineraries from Sydney and Pacific Dawn offering a seven-night Cup cruise from Brisbane. Ensuring the nearly 6000 guests put their best put forward at the premier thoroughbred race, a host of Australian designers will be represented on-board as part of the Fashions at Sea events. There will be styling workshops on-board Pacific Dawn with Naomi Bell and fascinator-making workshops across the fleet while racing-themed on-board activities will include presentations and photo opportunities with racing stalwarts such as Melbourne Cup winning jockey Michael Clarke; owner of winning horse Rogan Josh, Wendy Green; jockey and trackwork rider for Bart Cummings, Joe Agresta; and jockey Greg Childs. For the first time the cruise line is offering betting master classes with racing experts to ensure all guests know how to have a trackside punt. Other highlights include a Hats and High Tea event, a phantom race call and quintessential Aussie entertainment including Steady Eddy, Glenn Shorrock, The Tap Pack and Peter Byrne. P & O Cruises President Sture Myrmell said the cruise line had been sending ships to the Melbourne Cup since 1969, with the annual voyages remaining one of the cruise line’s most popular offerings. “Cruising is the ultimate way to experience the race that stops a nation,” he said. “It offers unbeatable value for a world-class event with transport, accommodation, meals and entry included, and also combines two of Australians’ great loves — cruising and horse racing. With a field that includes some of the best talent from Australia’s fashion and racing industries, our guests will be race-ready when they arrive in Melbourne, and will enjoy the journey as much as the occasion,” Mr Myrmell said. With its 8000 guests accounting for about 5 per cent of punters on the day, P & O Cruises will again offer its own VIP area at Flemington — the P & O Cruises’ Lawn. .
*I will be an on-board guest and guest speaker on board Pacific Pearl heading to Melbourne for Cup Day.